The Ministry of HRD along with AICTE, Persistent Systems, i4C and IIT Kharagpur is all set to host the Grand Finale of Smart India Hackathon 2018 – Hardware edition from Jun 18-22, 2018. This was disclosed by the Union Minister for Human Resource Development, Prakash Javadekar at a media briefing in New Delhi today. He said that the Smart India Hackathon 2018 is in line with the ‘Make in India’ initiative of the Prime Minister Shri Narendra Modi and is proving to be an important vehicle for scouting new ideas and help them convert them into products and businesses.Giving more details, the Minister said that the SIH2018 – Hardware edition is the first of its kind innovative initiative by Ministry of HRD to provide national platform to young technical minds of India to showcase their disruptive innovations and creative products which can bring out revolutionary changes in crucial sectors like agriculture, health, clean water, waste management, automotive, smart communication, and education. The Hardware edition is the sub-edition of SIH2018.He further informed that for Hardware Hackathon, 4362 team ideas were received with participation from 50000+ students across 752+ technical institutions. After two internal rounds of evaluations with support from industry experts, 106 teams have been shortlisted to compete under the 10 themes in the SIH2018 Hardware edition Grand Finale. 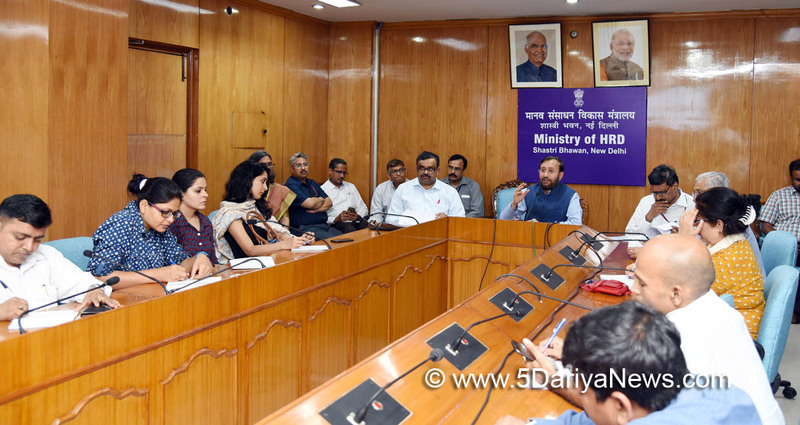 Prakash Javadekar explained that the Grand Finale of the Hardware Hackathon will be a 5 days event and will take place simultaneously at 10 prestigious institutions (Nodal centers) across India - IIT Kanpur (Drones theme), IIT Kharagpur (Agriculture theme), IIT Guwahati (Rural Technology theme), CEERI Pilani (Smart Communication theme), CSIO Chandigarh (Healthcare theme), IISc Bengaluru (Smart Vehicles theme), IIT Roorkee (Clean water theme), NIT Trichy (Waste Management theme), COEP Pune (Security theme), and Forge Coimbatore (Import Substitution theme).The judging during Grand Finale will be done by industry experts and angel investors. The top 3 winning teams under each theme will stand to win cash prizes – Rs 1,00,000/- to Winning team, Rs 75,000/- to First Runner up team and Rs 50,000/- to Second Runner up team. They may also get support from investors who are willing to invest in the products and make them market ready. Ministry of HRD is working closely with Dept. of Science and Technology to explore the possibility of handholding the winning teams for creating startups with the support from various Technology Business incubators (TBIs) across India. Attempts are also being made to explore new avenues of additional funding post Grand Finale for some of the most promising innovations.As per Secretary, Department of Higher Education, MHRD, Shri R. Subrahmanyam, the Smart India Hackathon 2018 – Hardware edition is nationwide hardware product development competition happening in India. Through this, we hope to give the technical students from our nation a chance to convert their innovative ideas into products with help of industry mentors, exhibit them to investors and get a chance to be one of the upcoming Start up initiatives.The Grand Finale for Software edition has already been successfully completed on Mar 30 & 31, 2018 at 28 nodal centers and now winning teams have started working on further enhancing their projects. SIH2018 has help India establish one of the biggest open innovation model.